I can't pinpoint the exact day, but sometime in the fall of 1987 the psychic flame went out. In fact, maybe it had gone out earlier -- that summer perhaps -- but I had only noticed it that fall. In any event, the retreat of the occult movement which just the year before had completed its annexation of my conscious being had occurred. I do remember the exact moment I realized that the psychic retreat had occurred: the day after Thanksgiving. Guru must have been out of town, because a disciple had invited me and a couple other guys to spend Thanksgiving day with him and his family in rural New Jersey. It turned out to be the best Thanksgiving I've ever had (before or since). Maybe that was because my expectations for it were so low. To start with: New Jersey? My experiences with the "Garden State" had been largely confined to drives to and from Newark (for the uninitiated, not a pleasant drive). Then there was Thanksgiving itself and the inevitable family issues that tended to linger just beneath the surface of the best of families. And here we were going to be a bunch of vegetarian cult members (in the family's eyes anyway) crashing the party. I didn't have high hopes. But it was great. Rural New Jersey, if not quite a "garden," is beautiful. The guys and I went for a short run on the trails behind the family home before dinner, which was incredible. My host's many grown brothers and sisters, and their spouses and children, all crowded around two full-sized dining room tables put end to end. As I ate, I sat there thinking: "This is what Thanksgiving dinner was meant to be." The next night, though, back in Queens, I noticed something different as I lay in bed. 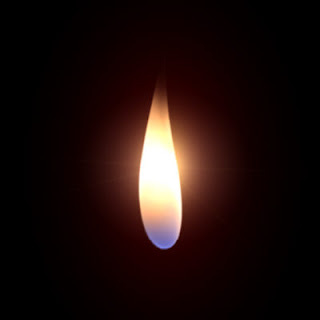 The psychic flame that had been an ever-present physical sensation in the middle of my chest since my first awakening some five years earlier was gone. Initially, this realization didn't cause me any panic nor really any concern. I just noted its disappearance. Little did I know then that it wouldn't return for another ten years. Hope it's okay to comment. Of course! Thanks for the kind words.